What could be the best tablet PC 2012? The last two years have seen an explosive growth in the Tablet PC market, with several manufacturers challenging Apple and their ubiquitous iPad. Which device will be the best Tablet PC 2012? Over the last couple of years, the Tablet PC has grown from nothing into a marketplace leader. Tablet PCs are light in weight, completely portable (much more so than a laptop) and have available an amazing array of applications. The concept of tablet PCs has been around since the 80s, with a few tablets being sold - the best selling probably being the HP tablets. However, the devices just never really made it in the minds of the general public. Possibly this was because you needed a stylus pen to operate them, thus giving you something else to have to carry; also the tablets weren't really one-piece as they generally had a slide out keyboard, making them heavier and more like a netbook. That said, business takeup was promising with many companies assigning tablets to their field workers. The introduction of the Apple iPad changed the game beyond all recognition. Takeup on the iPad has been outstanding with the public and businesses alike and many users have reported relying on the iPad for all their computing needs. But although the iPad may be the market leader, other companies have been releasing their own tablets in a bid to break the Apple monopoly. Any list of the top selling tablet PC 2012 has to include the Fujitsu Stylistic Q550. Fujitsu is a seasoned explorer in the tablet PC market, releasing its first offering as far back as 1989. Their latest offering is using the Windows 7 operating system. This could be a distinct advantage with Windows users who will find the interface very familiar, and of course eliminates many compatibility problems with MS Office apps and documents. The screen on the Q550 is of excellent quality with great readability. The battery life is poor though at only 4 hours (the iPad offers 10.) However, the battery can easily be swapped out. They on screen keyboard can be used with a pen-stylus if desired, which is supplied with the tablet. 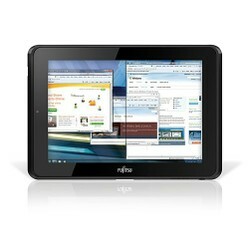 Although the Fujitsu Stylistic Q550 is an impressive tablet, it doesn't offer the user-friendly experience of the iPad. Plus, with a price tag of over $700, it's really not the best choice for anyone on a budget. A surprise new inclusion in the lineup for thisb year is the Amazon Kindle Fire. Released last year just in time for Christmas sales, this is a souped-up model of the older Kindle eReader tablet. This time around, the Kindle Fire boasts a full color screen, video streaming, web browser and selection of apps from the Google Android Market - plus of course it's well-received E-Ink book reader. The real selling point of the Kindle Fire is its price tag - under $200 for a combined tablet PC and e-reader is a bargain any way you slice it. The screen may only be 7" but the quality is superb and the feel of the tablet is very solid and not plasticky at all. It's not going to do everything the full-priced and well-powered tablets can do, but sales have been very promising and it's definitely taken a small portion of Apple's market share. Apple have announced that they are considering releasing a budget tablet of their own to compete. No matter the challenges from other manufacturers, Apple's iPad still reigns supreme as the best tablet PC 2012. The popularity of the App Store and the enthusiastic support from thousands of app developers have made the tablet extremely desirable and strengthened its position at the top. Google have announced development of their own proprietary tablet PC, and this could be a definite contender in the race. With the iPad 3 due out this year, Apple could yet have more surprises in store for consumers. Google and Apple will be the two companies going toe to toe this year in the battle for best tablet PC 2012. For more Tablet PC Reviews, visit my site! There are so many at this point it is hard to choose, but Kindle fire and Apple iPad 2 look really tempting to me.